Roberts, the leading, premium brand of flooring installation tools, has added a new generation knee kicker to its range. The Gel Pro 505 Knee Kicker features the latest in function, innovation, technology and design, all aimed at taking the strain off the professional carpet fitter without compromising the quality of the fitting. A thick 100% gel core bumper provides comfort and greater shock absorption which reduces knee shock, while the ergonomically designed handle is padded for a thicker grip, reducing hand strain. In terms of performance, the knee kicker when in use is set at an optimum angle of 5° to maximise impact and comfort to the natural angle of the knee, the quick thumb release adjusts to five positions from 45-55cms, and the ‘Bullneck’ design provides a 30% wider neck and is 30% thicker than previous models. Finally, a unique lever design allows the user to adjust the pin depth to suit different carpet piles very easily and a pronounced notch at the front of the knee kicker fits the corner of a stretcher head for an added nudge. With a durable rubber casing, the Gel Pro 505 Knee Kicker has a trade price of £79.50 and can be purchased from major flooring distributors and wholesalers. Marketed by QEP, the worldwide provider of innovative, quality and value-driven flooring and industrial solutions, Roberts is the premier brand of carpet installation tools, adhesives and accessories and has been for over seventy years. This latest addition to the range demonstrates Roberts’ commitment to meeting installers’ continually changing needs. 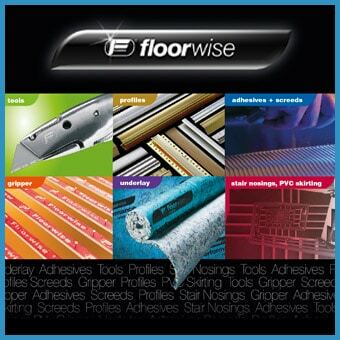 The brand remains the all time favourite and first choice for professional carpet and flooring fitters.